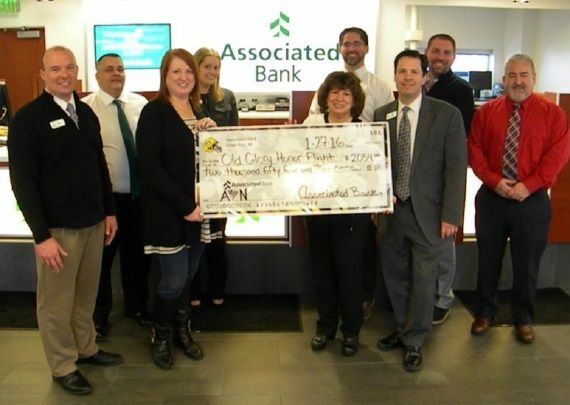 Associated Bank and the Associated Veterans Network (AVN), a colleague resource group that provides a network for military veterans within the company, raised more than $5,500 for a dozen Old Glory Honor Flights. Old Glory Honor Flight, Inc. is an organization dedicated to providing transportation to Washington, D.C., for local World War II and Korean War veterans. The goal is to get veterans to the national memorials and monuments that have been constructed in their honor. Jennifer Ray, talent acquisition executive consultant and AVN co-chair, helped organize the efforts that supported 12 Old Glory Honor Flights programs. “Supporting this organization is special because we know that what we are doing makes a world of difference to these veterans,” said Ray. In January, Ray joined several colleagues at the Grand Chute, Wisconsin branch to present a donation in the amount of $2054 to Renee Schroeder, board member for Old Glory Honor Flight, Inc. Among those present were senior project manager Vicki Betts, whose husband served in the U.S. Marine Corps for 21 years, and senior customer care system and support James Ryberg, who served in the U.S. Army Airborne Rangers and Charlie Airborne.